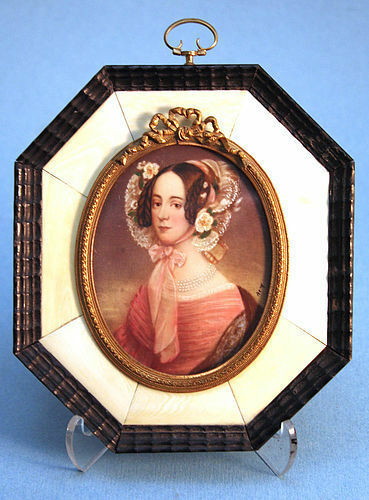 Oval portrait miniature of a young woman; watercolor, signed indistinctly. She is wearing a lace and floral trimmed bonnet, braids coiled over her ears, pearls and a ruched off the shoulder rose dress, all typical of the 1840’s. Sight size: 14.5" x 21.5"
Frame Size: 20.5" x 33.5"
Watercolor and gouache on paper, signed with initials “LMR”. 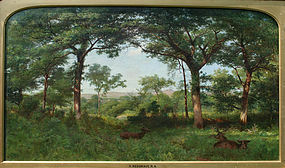 Oil on canvas, signed indistinctly lower left. A charming genre scene depicting a young peasant boy and girl taking a moment from their chores to play a game of cards while a fussing baby squirms on the girl’s lap. Oil on Canvas laid down, Signed and Retaining an Exhibition Pamphlet from a 1920 exhibit. Oil on canvas, signed lower right and titled and inscribed on the reverse: “Zia Dough Bowl, Zuni polychroe [sic] Jar, Zia Pot “pictured’”. Oil-on-artist board; signed l.r. and titled, signed and inscribed "Pozzuoli" on the reverse. Acrylic and Luminous Pigment on Paper, signed and dated "79"
Sheet Size: 22" x 30"
Frame Size: 27" x 35"
Provenance: Thomas McLean Gallery, London (retaining the original label on the back).